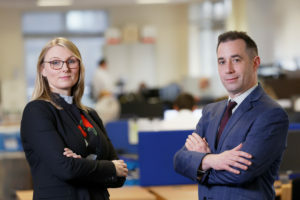 Leading Accountancy firm Bevan Buckland LLP’s vision of becoming one of the pre-eminent practices in Wales has been boosted by two new senior appointments at their Swansea HQ. These newly created roles will deliver two key initiatives of the company’s long-term 2nd Century strategic plan; to ensure continued growth and stability through the next 3 to 5 years in the face of Brexit, changing accountancy market, and to become the industry leader in the region for employee learning and development. For more information on careers at Bevan Buckland LLP, prospective candidates can find all the live vacancies at: https://www.bevanbuckland.co.uk/careers/vacancies, or email tom.miller@bevanbuckland.co.uk with a CV attached for a confidential career chat.